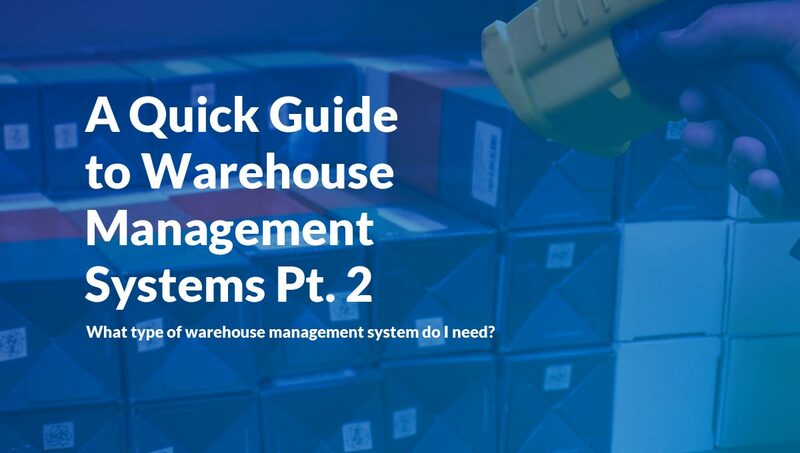 What is a warehouse management system?’ we discussed what a WMS is and what features most systems can offer. Our second blog looks at the types of warehouse management systems available to you and how to identify which one will suit your business best. Part two: What type of warehouse management system do I need? There are many types of warehouse management systems available on the market for your business to invest in. From very simple, stand-alone set-ups, to those that are part of complex, multi-functional enterprise planning suites (ERPs) – the options are quite vast. In addition, you can buy a WMS off-the-shelf, or have a generic system tailored to your business’ specific needs, or even have one built from scratch. So how to you decide what is right for your operation? The type, size and complexity of the WMS you will need typically depends on the size and nature of your organisation and its operations. At Keymas we offer two options – K-Store – our off-the-shelf WMS – and a bespoke warehouse management system, specifically designed and configured by Keymas programmers. Whenever we sit down with clients to advise them on which route to take, we start by asking a long list of questions. Can you adapt your current warehouse processes to fit around an existing WMS that is available on the market? If you can make some simple changes to your operations, without a great deal of disruption and cost, then why spend the money of tailoring a system for your specific needs? How many skus do you process and how many pickers do you employ? These statistics help to determine the size of your operation and is suggestive of the type of WMS solution you will require. But don’t forget, if you plan to expand your business, go for a system that can grow with you! What’s your company’s appetite for change? Don’t run before you can walk! If you’re moving from a paper-based process to your first WMS, keep your aspirations and specification simple. And if your team is not used to automated systems, then a fully integrated ERP could be a step too far! Whichever solution you choose you can expect some operational change. The right WMS will not simply track activity within your warehouse but will introduce new and more efficient ways of doing. Make a list of the features you require from your new WMS and then order them by importance. Try and find an off-the-shelf system that ticks as many boxes as possible. If there are show-stoppers e.g features you must have that no off-the-shelf system can provide, then look to a provider who can configure their WMS to suit your needs, without providing (charging for) lots of added extras you don’t want. Investing in a new warehouse management system is a big decision. Make sure you understand all the options available to your business and spend time assessing your needs before your choose a solution. If you’d like to know more about K-Store and our WMS configuration services, please contact us here.